This page will be updated with any news about Hardys and associated matters. Rob Woodall reports his estimate of ~263 Hardys during his extensive bagging exploits. He's completed or nearly completed many lists, both in the UK and abroad. Richard Hardy (no relation) reports he's added the Hardys to Munros and Wainwrights as climbing targets - 16 so far. How are others getting on? - do let me know! Bagging 8 Orkney Hardys in early June, including the two core Hardys there, has led to the discovery of an error in the identification of the highest hill on MAINLAND. It appears to be an error held by many Islanders, and gets included in tourist literature (note the Marilyn is the correct top, and some Wikipedia references get it right too). I discovered it through a chance meeting with a local hill walker on the summit of the "wrong" hill, and careful checking of the Explorer OS map revealed that the anonymous top northward across a broad shallow col was in fact a few metres higher! The "wrong" hill is the one you see from below on the south side, has a trig point and a high metal post, has a good track/path, and is the one named and "heighted" in road atlases, "general" maps and the like. From the north side no particular top stands out, so if you tried to pick out the "wrong" hill you'd assume that that was the top you were looking at, or that it was hidden by another (lower) top, at the back of the east-west ridge line, when in fact it's the "right" top you can see! So, ORKNEY - MAINLAND'S Hardy is not Ward Hill, but Mid Hill, with a spot of 275m on the OS Explorer map, at grid ref HY335087. It can be reached from Ward Hill, or up from a track above Bigswell on the north side. If so, it's number 344, and another near-sea level one - FOULNESS ISLAND in Essex appears to be an island on careful larger-scale re-examination of OS maps. The 4 core Hardys on the Shetland Isles have now ben bagged (MAINLAND, UNST, YELL, FAIR ISLE), and 5 non-core Hardys (MUCKLE ROE; BURRA, WEST; BURRA, EAST; BRESSAY and WHALSAY). I have now completed my Western Isles "round", with Beinn Mhor and Heaval, plus the last two non-core Hardys I could do "along the way" - pictures and more info after my return home. In glorious weather, I have so far bagged Clisham on LEWIS, Conachair on ST KILDA (HIRTA), Eaval on NORTH UIST and Rueval on BENBECULA. Today it's Beinn Mhor on SOUTH UIST, and finally Heaval on BARRA on Tuesday. Along the way I'm also bagging some non-core Hardy islands - 4 so far, 2 more hopefully. The Photo Gallery will be updated once I've sorted everything out after my return home! I finally conquered Carn Eige on Wednesday (24th May) after deep snow forced us back last year under the approach col. This year the weather was perfect, too hot really for 10 hours of hard hill walking! This completes my core Hardys on the UK Mainland - now just the odd Scottish island to do, starting with the Western Isles next week. The "hill-bagging" website mentioned in the News item below includes a link to Jeff Parr's "List of Lists" - every hill list you could possibly want, including the Hardys! It is inevitable that some Hardy entries are subject to error, for a variety of good reasons! Unfortunately not all high points are as obvious as Ben Nevis - particularly in some less hilly and/or more urban administrative areas. With this in mind, I have recently carried out a detailed comparison with high points listed on the excellent website www.hill-bagging.co.uk, in liaison with Simon Edwardes who runs the site, which fronts the Database of British Hills. As a result, there are some amendments to the Hardys hill list (and a few to the "hill-bagging" hill list as well). I will summarise these on this site in due course, but if you would like more details before then, do e-mail me (see the Contact page). The "hill-bagging" website also lists the various recent detailed height surveys of some contentious summits, and where these involve Hardys I will report on the latest results here soon. Finally, I have started to review the grid references of every Hardy, now that improved internet-aided accuracy is readily available to complement the old traditional method of estimation using paper OS maps! Again, I will report the review on this site (eventually!). Meanwhile if you have any queries or concerns, simply e-mail me as above, and I will be happy to help. If you have not seen it already, look out for Jonny Muir's very readable book The UK's County Tops (published by Cicerone, 2011), about the highest points of the 91 pre-1974 UK counties. Jonny has his own website too - www.heightsofmadness.com. The Long Distance Walkers Association's website now includes the Hardys as an authority for its Hillwalkers Register 3 (County Tops). The website is at www.ldwa.org.uk. Peter Stone has proposed Portsea Island (the centre of Portsmouth essentially!) as an island, which if correct makes it a Hardy as it is more than 1,000 acres. Examination of the creek on its north side at OS Explorer scale does suggest it is an island. Wikipedia says it's an island. If confirmed, it would be the 343rd Hardy, and with a natural high point of less than 10m (assuming the 11m triangulation pillar is on a man-made embankment) it would join the few urban or low-lying Hardys where the location of the high point has not (yet?!) been identified. At least this would not require a sub-number to slot it in at a particular height, it could simply become Hardy 343. The hill-measurers with all their ultra-modern technology have been at it again! Unfortunately, according to the August 2011 issue of Country Walking magazine (page 14), they only compared the "traditional" high point of NOTTINGHAMSHIRE with the top of a nearby coal mine spoil heap, which being man-made ground should not really be considered at all (in my view). At least the "traditional" high point won - just! When compiling the original Hardys list in the early 1990s, I purposely carried out original research, and only then compared my results with other lists. For County Tops, Nottinghamshire was the only real query, so I visited both candidates, and checked the maps, and decided on balance my candidate was likely to be higher (again, only considering natural ground). Since the hill-measurers (and others) knew of my list, and another very well-known hill-lister knew of my query even in the nineties, it would have been nice if they had checked it too (or if they recognised its possibility, at least have got in touch). The article 'Hardy (hill)' on Wikipedia was finally 'wikified' on 16th June 2011. Look it up! Three hills in three days to complete the Southern Uplands. Merrick is a fine hill, worthy of being the highest point of the hill range, with superb views of and from the hill once up on the ridge line - now just Carn Eighe and 25 Scottish Islands to complete the core Hardys (and 5-6 years of holidays in Scotland to do it, can't complain about that, despite the weather - Sgurr Alasdair still worries me though!). See the Bag Photos Gallery (5.1-3). The "Great Scottish Storm of 2011" put paid to Carn Eighe, deep slushy slippery snow even below the col under Mam Sodhail before the two Munro ridges sent us down, but got up Creag Meagaidh yesterday - good walking although still snow on the tops, except for the steep stony scree up into the cleft through the col below the last three slopes, just beat another weather system coming in! See the Creag Meagaidh summit ridge after a May snow storm in the Bag Photos Gallery (4.3). Finally got up Cruachan last Thursday, after two weather-forced failures 7 and 8 years ago. Went up with some friends from the North London & South Herts Ramblers Group, a good mountain in good company (and good weather? - not too bad actually!) - see Bag Photo 4.2. Any comments/photos? - why not contact me, or post something on the Forum! PS. The top of the highest boulder is at least 1m higher than the trig stump, that makes the summit at least a metre higher than the accepted height! - does it matter? I'm off to Scotland soon (at last, after quite a gap), hoping to do the last 6 mainland core Hardys: Ben Cruachan, Carn Eige, Creag Meagaidh, Green Lowther, Broad Law and Merrick. Then there'll only be some Scottish islands to do! - including Sgurr Alasdair on SKYE - aaaggghhh (might need some help from a local climber, any offers? - believe it or not, I have a phobia about vertical drops!). Photos will follow! The cheek of some people - posting on the Forum to advertise bags for sale! I've taken off the topics and banned the source, isn't it sad! Boundary clarification requires a change in the location of the BARNET High Point. However, there are two new candidates, both of which appear to be on the top of covered reservoirs (one trig, one spot), so a visit is needed to decide on where is the highest natural ground in this area. The spot height is higher than the trig height at 147m, and for information is located at OS 176/TQ219956 in Arkley on High Barnet's western edge. BBC 1's Countryfile featured Leith Hill today, the High Point of the NORTH DOWNS. The top of the folly tower on the summit is the highest point in South East England, the main reason for building the folly! The highest natural point in the South East is actually Walbury Hill, on the HAMPSHIRE DOWNS, 3m higher! The Hardys hill list is included as a section in the Wikipedia article Hill Lists in the British Isles. A separate Wikipedia article on the Hardys list itself (just a short summary) is in preparation, awaiting sufficient "notability" status. Autumn's Lifeboat magazine included an item on a challenge by the Tower (of London) Lifeboat Station crew completing all 5 UK Countries' and Eire's High Points in under 48 hours - congratulations! Eire's highest point (not a Hardy, which only covers the UK) is Carrauntuohill. I thought when we arrived this might be another "inaccessible" Hardy, but you can just stand on it between a gated private road and a gated covered reservoir! - see the Photo Gallery. Perhaps with all the newer local authorities, there are more than a few Hardys which are on "no entry" private land of one sort or another! - oh no, not another list! Bagged the lowest identified Hardy at last - a nondescript bramble patch on the back edge of a green fronted by beach huts (see the Photo Gallery), as far as I can judge anyway. Are any of the unidentified urban Hardys lower than this? If you can prove any are, please let me know - and/or post it on the Forum or the Facebook Group! 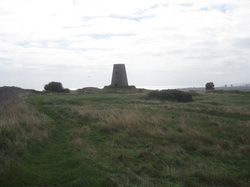 2010's WightLife magazine mentions St Boniface Down, the island's Hardy. It is topped by a radar station, making it one of the few Hardys where you can't actually get to the exact highest point (unless you know someone on the inside!) - although the exact highest point is not easy to judge! It was built in 1938, and was pre-eminent in WW2 in giving advance warning of aircraft raids (so much so it was bombed itself - by 245 planes apparently!). An information board at Cleadon Mill (OS 88/NZ389632) on the Great North Forest Tail (I think) claims the highest ground nearby (on a golf course) is the High Point of TYNESIDE, SOUTH. In fact the High Point is [Down Hill], 3 miles to the south west. The Council have owned up to their mistake (well done, Matt Hawking), promising to rectify the error. Cleadon Mill is quite scenic, I wonder if [Down Hill] is? Although the book is available on the website at no charge, it is also available on a DVD (same format and parts) at a cost of £5. If you would like details e-mail the.hardys@btinternet.com titling it DVD. There is now an open Group on Facebook for The Hardys "The Hardys High Points" - why don't you join! The Ramblers' Magazine Walk's current issue includes a 7 mile walk (No.2, p.51) which includes Earl's Seat, the High Point of the CAMPSIE FELLS . The September 2010 Trail contains a superb double page photo panorama of Ben Macdui in all its remote majesty (pp.12-13), plus a profile photo of the Cuillin Ridge on SKYE (p.26). There's also an ad for The Hardys (if you can find it, perhaps I should find the money for a bigger one next time!). As mentioned elsewhere on the site, new features have now been added, as well as various minor amendments and improvements. I hope you like them (let me know one way or the other - see the Contacts page). My web designer (and neighbour), Alex Page (to whom huge thanks!) is now off back-packing with her husband. My wife Sandra and I wish them bon voyage and a fantastic year globe-trotting. However, this does mean that anything too complicated will probably need to wait until she's back! - so fingers crossed everything techie works meanwhile! The Bag Totals page now contains full details of the champagne on offer for rounds of Hardys in various categories. The BBC News website has included an item on St Kilda focusing on the history of human habitation, but the item contained some nice photographs, including a view of the archipelago from the sea showing the High Point - see the Bag Photos page (and one from the slopes of the High Point looking down on the former settlement). The first of several advertisements for The Hardys appeared in August's Countryfile magazine, prompting a little surge in visits to this website. Welcome to all newcomers! The plethora of lesser-known Scottish islands seem fairly anonymous unless you are familiar with them, but each has its individual character and history. A beautifully moody sunset photo of LISMORE featured in the Summer 2010 issue of Butterfly, Butterfly Conservation's magazine, in an article about conserving the Marsh Fritillary. Alan Dawson tells me that a recent survey of the summit area of Ward's Stone indicated the highest point was a cairn-topped small hag near the eastern trig point at ~563m. However I have yet to hear whether Ward's Stone itself was included on the survey (so judgement is reserved!). I have now "bagged" the six Northern Ireland core Hardys, plus MERSEYSIDE and BOWLAND, FOREST OF, so visit notes for these Hardys are available in addition to those on the Bag Info page. These complete my core Hardys round for England, Wales and Northern Ireland - only all those Scottish islands (and one or two still on the mainland) to go! Note that my bagging total has not yet been updated to reflect these recent visits. A recent visit to Ward's Stone, the High Point of BOWLAND, FOREST OF, has indicated that the highest point is neither triangulation pillar but "Ward's Stone" itself at +562m, near the trig at the western end of the summit plateau - a revised Hardy listing will follow. Is Ward's Stone the only summit with more than one trig?